Nvidia has just finished hosting its big investors' event, and the big reveal was its next-generation mobile Kepler GPU chip. 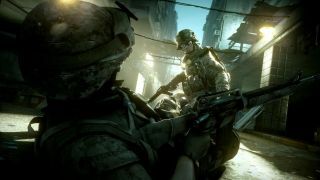 Jen-Hsun Huang, Nvidia's chief exec, demonstrated the generational leap by comparing footage of a current-generation iPad 4 game with some of Battlefield 3 running on the new mobile GPU. VentureBeat posted a recording of the video presentation, which is a suitably impressive look what smartphones and tablets could soon be capable of, while Huang called current iPad graphical capabilities "vintage 1999". Nvidia's new Kepler chip will be capable of playing high-end PC games, and we expect to see it appear in the first Tegra 4 device when it appears (with Project Shield likely getting in there first). This means that Kepler Mobile will likely come in Tegra 5, and will give phones and tablets the ability to churn out high-end specs and DirectX 11 graphics when it does. "We want to get multiple years ahead of the competition," said Huang. "It was worth the sacrifice." By sacrifices, Huan was referring to how the company delayed other priorities to push Kepler Mobile ahead. Nvidia also confirmed to investors that its Project Shield gaming device was still on schedule for a Q2 release this year, which is good news for those who have been doubtful Nvidia could deliver in time. Huang also added that the device was aimed at driving Android gaming to its full potential. He announced that Nvidia had invested $10 million (around £6.5m/AUS$9.5) in Shield, making it significantly less costly compared to other big console launches.